The party goes down August 27. 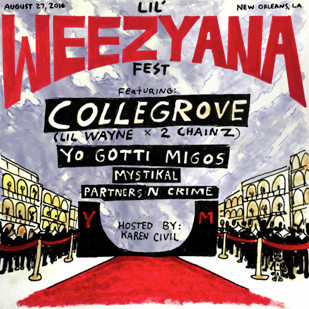 Lil Wayne has announced the rest of the lineup for the second iteration of his Lil Weezyana Festival happening in New Orleans. Wayne himself along with 2 Chainz will headline as Collegrove and will be supported by Yo Gotti, Mystikal, Migos, and Partners N Crime. The whole bash will be hosted by Karen Civil. The festival will be streamed lived via TIDAL. Tickets can be purchased here.